We are a leading Manufacturer of silicone autoclavable gaskets, adhesive gaskets, silicone rubber fittings, silicone sponge gaskets, silicone endless gaskets and silicone tri clamp gaskets from Ahmedabad, India. 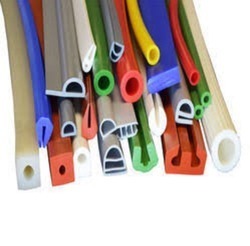 We are engaged in offering an array of Silicone Autoclavable Gasket (Extruded Door Gasket). We offer them in more than 1000 different shapes and designs. The soft Silicon Sponge Gasket (Hardness range from Shore A15 to 30) to solid silicon Gasket (Hardness range from Shore A35 to 85). We use premium grade Food-Pharma Grade Silicon Rubber in the production. The use of these raw material helps in withstanding high temperature. We offer these gaskets in square cross sections like 20 mm x 20 mm, 25 mm x 25 mm x 25 mm with central hole of 10 mm diameter. To make them look more elegant these gaskets are offered in red, white, orange and other as per the specific requirement of the clients. These are widely appreciated for their dimensional preciseness, sturdiness, flexibility and longer functional life. Temperature range : - 80 °C to + 250 °C. We are one of the preeminent manufacturers and exporters of qualitative Silicone Sponge Gaskets. These are produced and offered to customers in round square and rectangular cross section with multiple color options. Our silicone sponge gaskets conform to the standards PDA 21 CER 177.2600. These gaskets are used in industrial segments like tractors & farm machinery, components/assemblies manufacturers’ hydraulic machinery and flanges and fittings. We are the manufacturers of Silicone Endless Gaskets. Silicon Endless Gaskets are manufactured by step molding process. These available in various sizes and thickness as per the need of the customer. Looking for Silicone Gaskets ?